Sub - Reuters is typically my first go-to. Interesting 4 were nominated by the POTUS. Guess he didn't run the "loyalty test" on them. LOL. The Boston Globe had an opinion piece today that discussed the recent cold snap and how coal and oil were making most of the power. I was reading a traditional hard copy so don't have a link to it that isn't pay walled. The author had figured out that NIMBY resistance to natural gas pipelines and off shore wind plus the closing of nuclear power plants had forced to power companies to turn to the traditional ,cheaper and dirtier supplies. The expression "letting the perfect be the enemy of the good" came up. Worth a read if you have access. "Eventually, the remaining plants may reach the point where they're unable to earn sufficient margin to justify ongoing maintenance and will effectively be run to failure ... "
Power grids may face “massive” upheaval as more uneconomic plants close, according to the report by Bloomberg New Energy Finance. The problem is particularly bad in Florida, Georgia and elsewhere in the Southeast, where the distance from major coal mines drives up prices. The study examined the monthly economic performance of every U.S. coal plant in operation since 2012. Still, many coal plants manage to shield themselves from economics. About 95 percent of those with operating expenses exceeding revenue operate in regions where regulators set rates, the study found. Instead of allowing market forces to determine their fate, regulators and utilities often keep struggling plants open to ensure stability on their grids. Grid stability is worth paying for. Nakoso IGCC Power's construction of the IGCC plant—the world's most advanced coal-fired power plant—is being developed to create industrial infrastructure and contribute to the revitalization of Fukushima Prefecture. Storage and production are two different things.As we build more intermittent renewable power producers we will need to develop and build storage to make that viable but the combination of renewable power and it's storage will always be more expensive then a simple coal fired plant with it's ability to store a years fuel in the yard and produce peak power on schedule. We will phase out coal for the pollution and climate change concerns but we should not do it until we have built and tested the replacement system. I just don't believe that. 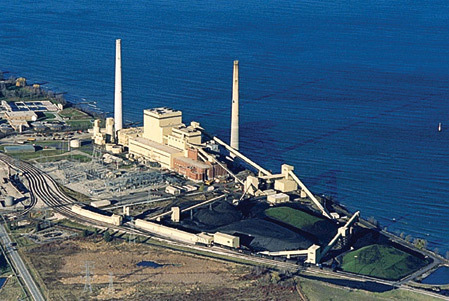 This is a recent aerial photo of the Edgewater power station on the West coast of Lake Michigan in Sheboyban, Wisconsin. This is now an Alliant Energy Center, although it was originally constructed by another company. This former coal plant has completed a six year natural gas conversion which mainly involved the construction of a large diameter gas main, an expense shared with the nearby city of Sheboygan's taxpayers, because the city's residences are now also primarily heated by natural gas, thanks to the fracking boom. Note the large heaps of coal. The green "hills" are coal heaps that have been there long enough to grow a cover of vegetation. The black coal heaps are more recent. There are no coal trains in the above photo, because in actual fact they have been burning mainly gas for years, although they retain the coal pulverizers and the large "vortex" blowers that enable relatively efficient combustion of coal dust. The coal heaps above represent several weeks of standby fuel, ready to be consumed via the large conveyers you see to feed the coal pulverizers. As originally built seven decades ago, the Edgewater facility burned Eastern "hard" coals, delivered by barge from Pennsylvania. In more recent years, the railroad tracks you see were added and the softer "brown" coals of Wyoming have been burned. This power plant is being renewed on a regular capital replacement cycle, but it remains a large facility whose primary fuel source is powdered coal, which can still be delivered by docks and railroad tracks. It was not designed to burn natural gas, and it is very definately not being converted to a natural gas "co-generation" power plant that would use gas more efficiently, it remains a classic high pressure steam turbine facility. The reason that the very expensive gas main was constructed at all was the pending deadline that POTUS Obama imposed by Executive Order when he set in place his famous "Clean Power Plan". This in fact is the reason that US carbon dioxide production dipped in 2017, as utilities prepared to transition coal plants to cleaner fuels. In fact tomorrow, March 28, 2018, represents the one year anniversary of Trump's repeal of the Clean Power Plan. I expect that as a consequence the EIA figures for 2018 will not show a continuing reduction in the USA's carbon emissions. I also want to express the opinion that Trump's repeal of the Clean Power Plan will have effectively slowed the USA's conversion to renewable energy sources. Furthermore, should market conditions dictate a natural gas shortage (or if such a shortage occurs for any reason, for example a Middle Eastern war) the USA's consumption of coal and carbon emissions will spike upwards again. One of the things that makes coal a good standby fuel is that you can just leave it lying on the ground in a heap - such as the years-old coal heaps above at Edgewater - and then burn it, even if it's wet and covered with green grass. Believe me, it is painful for me to point these things out. I HATE coal power plants because of the toxics they emit. Not only do they make active emissions while in use (which have to be "scrubbed" from the stacks with a spray of limestone slurry) but decades of coal consumption also leave a long term toxic legacy of radioactive emissions and heavy metals, which serve to poison the areas around the plants, and introduce these same toxics to the human food chain via crops and animal feed grains. So expect that US coal consumption is poised to resume at higher rates than ever, reversing recent trends and ending the good news about renewables. I really do wish this were not so, I'm a huge fan of renewable energy sources. A couple of things there KJ. One, natural gas is not a renewable fuel so switching to it is a matter of regulation and price. Two, Obama's war on coal was way too fast and was actively putting the cart before the horse just as I cautioned against in my post above. Three, It will take an awful lot of windmills and solar panels to replace that plant but they probably will build them eventually. By that time we may have truly passed peak oil and will likely be distilling coal oil (kerosene) from coal to fly our jets and run our other diesel engines. When I said we will phase out coal I meant over decades. I well understand that NG is a FF and not a renewable. It is however a relatively clean way to power the transition from petroleum to electricity for transport fuels. Oil literally is too precious to burn as transport fuel, we should be using the petrochemicals for plastics and myriad other purposes. Ethanol really is too precious to burn either, it should be consumed directly, except it really is too early for that, at least on the West Coast. The human race has never been good at long term thinking, which drives me bonkers to think about, so I mostly don't. Baha, did you get a chance to watch this link Tanada posted previously: 100% Renewables (100% WWS) Roadmap. It's 24 minutes so watch it when you have some free time. Not sure the probability of a coal plant reserve making making it through whatever legislative process but this could have an effect on US electricity prices. I would think that the oil and gas industry would be against this. According to wire reports, the president has asked Secretary of Energy Rick Perry to create a "strategic electric generation reserve" loosely patterned after the Strategic Petroleum Reserve created more than 40 years ago to stockpile crude oil for national security. Under a tentative plan, the Department of Energy would, for the next two years, create and maintain a list of endangered coal and nuclear power plants. Grid managers would be required to buy power from these plants, though it would be more expensive than power from the growing fleet of gas turbines and wind farms. The administration's reasoning is that the large coal and nuclear plants not only operate around the clock but also are "fuel secure" and therefore add stability, or at least backup, to gas plants that do not store fuel onsite and, in theory, could be disrupted. I am profoundly disturbed by these actions, because they deny the reasons for retiring coal plants, which are that they spew more carbon dioxide than other types of power generation, and more disease-causing hydrocarbon pollutants. baha wrote: I can give you grid stability for a reasonable fee... and a big pile of Lithium. But instead of burning the lithium and polluting the world with CO2 and ash, I will just put it in a can and use it to store spare electrons. In ten years when the lithium is tired I can open the can, reprosses the lithium. and start again. I could put the battery storage plant right where that nasty old coal plant used to be. The wires are already there. There was an article yesterday about wind power potential in NC. It seems we could produce 5 times the power we use with offshore wind farms. Then we could use a superconducting DC transmission line to connect to the battery facility located where the coal plant used to be. Lithium ion batteries are a great fit for portable electronics and EVs. Cars spend 95% of their time parked. And drivers rarely discharge their batteries to the maximum amount allowed, further prolonging their battery life. So the duty cycle for your typical EV battery is light. Contrast that with the duty cycle for a grid storage battery that may have to discharge-charge multiple times per day and have far greater depth of discharge. This greatly curtails the amount of life cycles you get out of the battery. Not to mention the safety issue of lithium batteries. There are other battery technologies out their that are better suited to the duty cycle of grid storage. However lithium ion has first mover advantage and those who try to compete with it often get crushed. So for now we are stuck with batteries that are not very good for grid storage. Manufacturers of lithium-ion batteries for EVs and handheld electronics would naturally like to apply their technology that was designed with only one application in mind – high energy density – to large-scale energy storage. But just because it is right for your phone, laptop, or hoverboard, it doesn’t mean lithium is the right chemistry for far more demanding, higher energy uses. Lithium-ion’s high energy density is useful for personal electronics where (smaller) size matters, but for stationary storage applications that need to have the ability to handle high power and/or long duration applications multiple times a day, a far more versatile, robust energy storage system is required. Duration, cycle life, versatility, and overall battery life are areas where the chemistry and design of lithium-ion energy storage systems don’t stack up. Large-scale lithium-ion battery makers know how important safety is. That’s why they design very complicated cooling and fire suppression systems for their units to keep the system from entering thermal runaway. As distributed energy storage systems become more and more commonplace, the likelihood will grow that they need to be deployed in highly populated areas next to schools, hospitals, office buildings, etc., so even if all costs were equal lithium-ion begins to be a difficult choice. Stationary energy storage systems must be able to withstand punishing duty cycles, sometimes requiring full charge and discharge cycles multiple times a day. While a redox flow battery can facilitate these requirements several times in a day if necessary, most lithium-ion based energy storage systems are capable of only one daily cycle and often have a mandated rest period. The fire suppression and cooling systems necessary for lithium-ion energy storage systems also add to the size and weight of the overall units and decrease efficiency, add complexity, and increase field reliability concerns. These limitations reduce the amount of revenue-grade energy the system can support every day, week, month and year. Furthermore, lithium-ion cells degrade continuously over time and they need to be replaced frequently. Lithium-ion batteries certainly have their place in the electronics world as their energy density in a small form factor has facilitated the ever-decreasing size of all our mobile devices. But if people are waiting on the low-cost lithium magic bullet to make grid-scale stationary storage widely available, they should instead simply go with the flow [battery]. li-ion batteries are well suited to transportation applications, but not necessarily ideal for the grid, and locking in on li-ion batteries is making it difficult for producers of alternative storage technologies to survive, much less continue to innovate and scale up. That could block the entry of more optimal alternative technologies that may be longer lasting and have a longer cycle life. There are signs both are already happening. In addition, the immense amount of capital being poured into expanding lithium-ion production raises the pressure on other players to compete on price alone. The lithium-ion cost curve is an aggregate of technologies used for a variety of applications, but mostly for electric vehicles and electronics, and thus it does not accurately reflect the costs of li-ion batteries for utility applications. The costs of utility scale li-ion batteries have some unique qualities that are not fully reflected in many of the li-ion cost curve projections. So far this year, at least two battery manufacturers working on novel technologies have declared bankruptcy. In March, Aquion Energy filed for bankruptcy. Aquion was known for its aqueous hybrid ion battery technology, which the company touted as a safer and cheaper alternative to li-ion batteries. And late last week, Alevo USA and Alevo Manufacturing, both part of Alevo Group, filed for Chapter 11 bankruptcy court protection. At one point, Alevo was seen as a rival to Tesla. In the end, Alevo has “insufficient revenue to continue operations.” It is now seeking to liquidate its assets. Apparently the Russians missed the memo that no one will be using coal anymore? I'm sure this development fits in with their Paris commitments once they get around to ratifying the agreement in 2020! Exports of coal from the Russian Arctic city might almost double to more than 25 million tons per year when construction of the new local coal terminal is completed. An agreement was this week signed by the State Transport Leasing Company and the Federal Agency for Maritime and River Transport. The deal, a so-called concessional agreement, includes the investments of 24 billion rubles (€320 million) in the new Lavna terminal. jawagord wrote: Apparently the Russians missed the memo that no one will be using coal anymore? I'm sure this development fits in with their Paris commitments once they get around to ratifying the agreement in 2020! The piece does not say what countries are importing this Siberian coal. I would think China bound coal would just move by rail southeast.